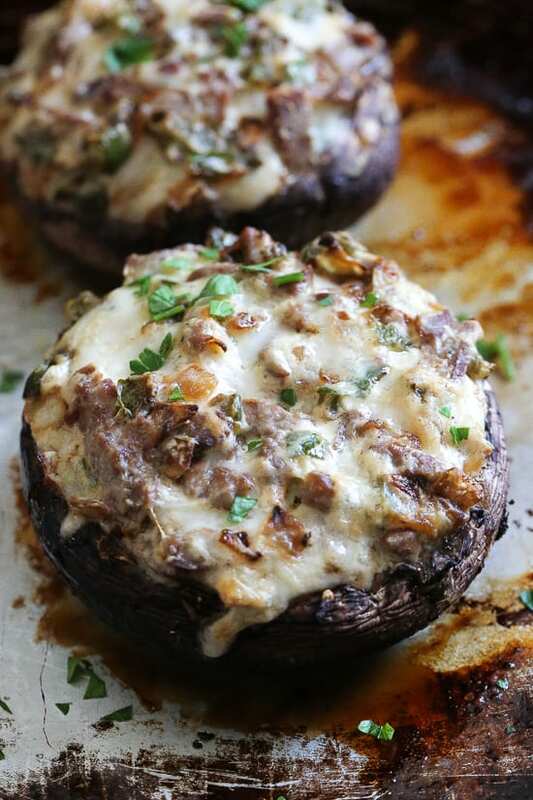 It doesn’t get much better than these Keto Philly Cheesesteak Stuffed Portobello Mushrooms! Steak and mushrooms are great together, so why not put them together with some added cheesy deliciousness! This recipe is great if you are on the ketogenic diet. It will leave you feeling full and satisfied. Preheat the oven to 400F. Spray a baking sheet with oil. Gently remove the stems, scoop out the gills and spray the tops of the mushrooms with oil, season with 1/8 tsp salt and fresh pepper. Spray a large skillet with cooking spray and heat on high, let the pan get very hot then add the steak and cook on high heat about 1 to 1 1/2 minutes on each side, until cooked through. Transfer to a cutting board and slice thin, set aside. Reduce the heat to medium-low, spray with more oil and saute onions and peppers 5 to 6 minutes, until soft. Combine all the ingredients in a medium bowl. Transfer to the mushroom caps, about 1/2 cup each. Bake in the oven until the cheese is melted and the mushrooms are tender, about 20 minutes. Try this quick, easy and delicious recipe out and let us know how it was for you.